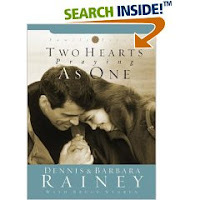 Two Hearts Praying as One, by Dennis & Barbara Rainey has been sitting on our bookshelf for sometime. I figured it's a quick read (88 pages) and there was no excuse for me to not decide whether or not it warranted shelf space. (We've discovered and have been victimized by so many cheesy marriage books that it's not funny.) You have to understand that my husband and I are readers. When we are about to engage in a new activity (i.e., marriage, child rearing, photography, even ballroom dancing . . .) we read just about everything we can get our hands on. Two years ago, when we embarked upon this glorious adventure called marriage, we read a lot. This is one of the books that landed in the stack of Things to Read. I do not wish to downplay this book so bear with me. I think it's simple. I think of it as a "jumper cable" approach to learning how to pray with your spouse. It gives helpful hints and motivational stories to encourage you to want to pray with your spouse. One thing I think they said that was different than other books I have read is that in order to find intimacy with your spouse, you must learn how to pray with them. Through prayer you will discover your deepest needs, fears and wants. I think there's truth in that. It certainly helps to speed up the process of knowing your mate's true heart! This would be one of the reasons, I suppose, pre-marital counselors (of the Christian variety) frequently ask their counselees whether or not they take time to pray together. Anyone and everyone needs a jump start in their marriage from time to time (don't care who you are) and this book may provide just what a couple needs. Then again, it might not. There's nothing incredibly impressive in this book, but it is filled with basic truths and sometimes that's exactly what we need to hear! I don't know if you've been reading my new column at 5 Minutes for Mom (book reviews on Mondays), but I have several marriage books coming up--not for a month or so. However, I have a bunch of parenting books coming up, and if you've embarked on parenting like you embarked on marriage, you might be interested. There are a lot of common-sense parenting books, too, but some that really grab me. There's almost always at least one giveaway copy, too.